This article is written by Moogiefish. The eleven rack is a product that came out last year from Digidesign now Avid. What it is, is a usb ProTools interface (plus it can be used for other DAWs at the sacrifice of some features)/reamping system and a rack preamp and effects processor. As an interface it has a mic preamp with pad and phantom power, midi in and out, a line in and out, and an unbalanced guitar input with their true Z input circut. Where it really shines thought is as a guitar effects processor. It all starts with the true Z input which is built to simulate the input impedance of a real amp then it hits the effects and amp chain. the chain can have six effects at one time with a wah and volume pedal along with whatever effects you have in the effects loop an amp and a cabinet with a mic that is either on axis or off axis...oh and it has a tuner. So it has 16 amp models, 7 cabinet models, 7 mic models, 2 wahs, a fuzz, a distortion, a overdrive, 5 modulation effects, 2 reverbs, 2 delays, a graphic eq, a compressor, a volume pedal, and a noise gate which is a part of all of the amp models. Navigating all of it is really simple. The amp can be accessed through two or three button pushes, and the effects can be accessed by pushing their respective button on the front panel. They really went out of their way to make everything simple to do...except programming a midi foot controller which is an evil affair. Sound-wise it is great, the cab and mics are Impulse response models. The reverb is lush and on the spring reverb you can get that wet surf verb. Amps are very dynamic responding to your touch and the volume knob. You can control the amp and effects through the six knobs under the display. To hear it you can plug it into an amp,pa,power amp into a cab, or a powered speaker using either the xlr or unbalanced 1/4" outs. Plus for silent enjoyment it has a headphone out on the front panel. Now I know a while ago a did a post on the axe fx raving how great it is...and my stance on it has not changed. As a stand alone effects processor/preamp it is the stick by all others are measured in features and sound quality. The reasons why I think the eleven rack is great too and why I bought it instead of an axefx is that, one it is a lot cheaper about 1000 dollars cheaper, two it is an interface, three it comes with pro tools le, four even at its price it still has a lot of really good and usable sounds. It is like comparing apples and oranges they are different but in the end are both fruit so you just got to choose. The atomic amp/cab is a tube powered active cabinet made specifically for digital modeling systems. 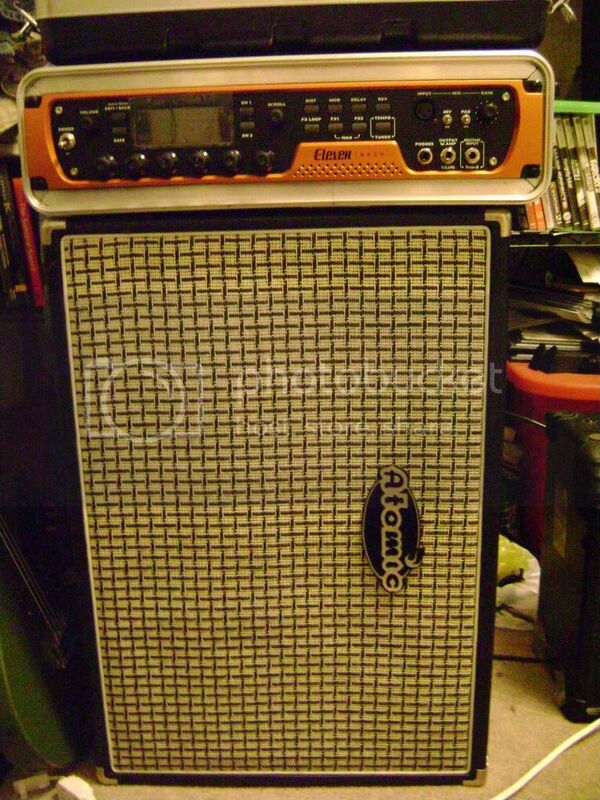 this particular model is their discontinued 1x12 18 watt cab, and even thought it is 18 watts it is loud. Sound-wise it is very clean with very high head room so even at high volumes the sound of the modeler shows through. It has no volume knob on it, all volume is controlled from the digital unit so you want to turn on you preamp first check your levels then turn on the cab, which is usual tube amp, preamp/poweramp practice. but other than that it is a great amp. If you're a fan of OC ReMix, then you probably know all about this album. If not, then you should probably check out their site. OC ReMix is a community of video game music fans who arrange, interpret, record and mix their favorite video game music in MP3 format. They have almost 1,500 remixes, from a very wide spectrum of games and platforms. 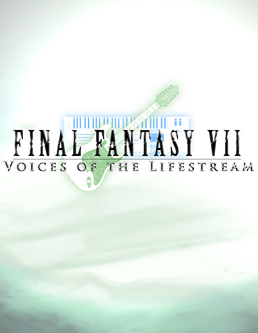 Last month, they released Final Fantasy 7: Voices of the Lifestream, an entire album devoted to the legendary game, which has some of the most memorable video game music ever. As with everything that comes from OC ReMix, the album is completely free. It contains 45 arrangements arranged by over 40 different artists. It covers all genres of music, including rock, jazz, classical, techno and much more. Some tracks even include recorded vocals! This thing is a masterpiece. It represents the spirit of the game music community, and how far it has come in the past few years in terms of the passion, creativity, devotion and popularity. When I first began listening to this album, I could not get rid of the chills. The nostalgia factor in this album is high, be warned.